A clever trick borrowed from jellyfish has earned two American researchers and one Japanese-born scientist a share of the chemistry Nobel Prize. Martin Chalfie, Roger Tsien and Osamu Shimomura made it possible to exploit the genetic mechanism responsible for luminosity in the marine creatures. Today, countless scientists use this knowledge to tag biological systems. Glowing markers will show, for example, how brain cells develop or how cancer cells spread through tissue. But their uses really have become legion: they are now even incorporated into bacteria to act as environmental biosensors in the presence of toxic materials. Jellyfish will glow under blue and ultraviolet light because of a protein in their tissues. 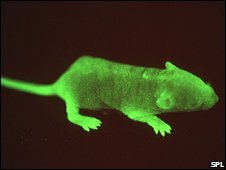 Scientists refer to it as green fluorescent protein, or GFP. Shimomura made the first critical step, isolating GFP from a jellyfish (Aequorea victoria) found off the west coast of North America in 1962. He made the connection also with ultraviolet light. Meanwhile in the 1990s, Chalfie demonstrated GFP's value "as a luminous genetic tag", as the Royal Swedish Academy of Sciences described it in the Nobel citation. Tsien's contribution was to further "our general understanding of how GFP fluoresces". In essence, he started to tune it, to broaden the palette to colours other than green. This was significant because it has allowed scientists to follow a number of different biological processes at once. GFP has now become a standard laboratory tool. As well as assisting fundamental research in simply revealing how biological systems work, it has become invaluable in the domain of genetic engineering. 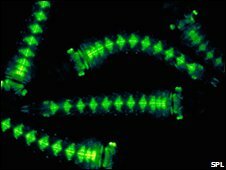 Scientists trying to modify a plant or animal will often include the gene responsible for GFP as part of the change. Fluorescence will then tell them if the modification has been taken up successfully or not, dramatically improving the efficiency of the research. It is this science which has led to the stream of popular media stories down the years of "glowing" rabbits, butterflies, pigs - and all the other green-tinged animals to emerge from laboratories. Just how far colouring techniques have come was demonstrated eloquently last year by a team led from Harvard University. The group used a combination of multiple fluorescent proteins to colour brain cells (neurons) in up to 90 distinct colours. 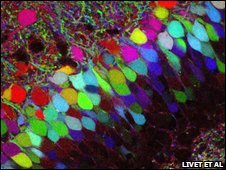 They published a stunning image in the journal Nature which they called a "brainbow". Osamu Shimomura is affiliated to the Marine Biological Laboratory, Woods Hole, US. Martin Chalfie is at Columbia University, New York; and Roger Tsien's home institution is the University of California, San Diego. They share the prize equally. The Nobel Prizes - which also cover physics, medicine, literature, peace and economics (more properly called the Sveriges Riksbank Prize) - are valued at 10m Swedish Kronor (£800,000; $1.4m).